In this June 21, 2017, file photo, Facebook CEO Mark Zuckerberg speaks during preparation for the Facebook Communities Summit, in Chicago. Facebook CEO Mark Zuckerberg said Friday the company will require advertisers who want to run either political ads or so-called "issue ads" —which may not endorse a specific candidate or party but which discuss political topics— to verify themselves. Also Friday, Facebook acknowledged secretly deleting some messages Zuckerberg has sent through its Messenger application, an option that hasn't been available to most of the social network's 2.2 billion users. 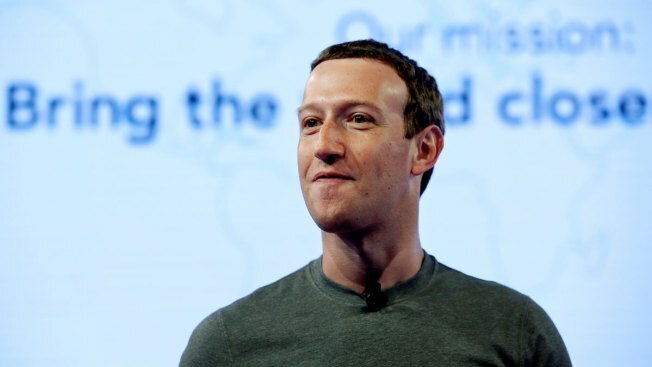 The developments comes as Facebook faces questions about trust in light of one of its worst privacy scandals in its 14-year history. The company said it has been removing Zuckerberg's messages from the inboxes of various people for several years. The recipients of Zuckerberg's messages weren't informed before that happened. Facebook made the acknowledgment Friday after TechCrunch first reported the tactic. Facebook: To Delete or Not to Delete? As more details emerge about the data privacy scandal surrounding the Trump-connected firm Cambridge Analytica and Facebook, some users are revisiting the concept of leaving the social media site. The hashtag "Delete Facebook" is trending online as Americans vow to take a step back from the social network following reports of misuse of some 50 million profiles. NBC News' Liz McLaughlin reports. Facebook said it began erasing the messages of Zuckerberg and a few other top executives in 2014 after computer hackers obtained and released emails from Sony Pictures executives. The Sony messages included disparaging remarks about movie stars and other people in the entertainment industry. Although the ability to automatically delete sent texts hadn't been previously available, Facebook says it now plans to make it available to all users. The company apologized for not doing so sooner. The company made the announcement about the same time Zuckerberg said it is working to strengthen its system ahead of this year's U.S. midterm elections and other elections around the world. The company has already required political ads to verify who is paying for them and where the advertiser is located. The requirement for issue ads is new. In addition, Zuckerberg said in a post that Facebook will also require the administrators of pages with a "large number" of followers to verify their identities and addresses. The company did not specify what number of followers would trigger the requirement. The moves are intended to clamp down on fake pages and accounts such as those used to disrupt the 2016 presidential elections in the U.S. and elsewhere. It's the latest response from the company after it was revealed that political data-mining firm Cambridge Analytica used ill-gotten Facebook user data in its efforts to sway elections. Zuckerberg will testify before a House committee on Wednesday, and Facebook will begin alerting users whose private data may have been compromised in the scandal starting Monday. All 2.2 billion Facebook users will receive a notice on their feeds titled "Protecting Your Information." It will have a link to information on which Facebook apps they use and what information they have shared with those apps. In addition, 87 million users whose data might have been shared with Cambridge Analytica will get a more detailed message informing them of that fact.